Stunningly crafted, this artistic shoji screen features a bamboo silhouette design that makes for great decoration in any setting. Ideal for rooms with high ceilings and creating a more substantial feeling of privacy. 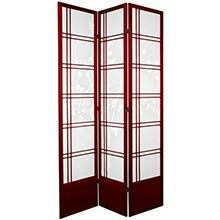 Ideal for rooms with high ceilings and creating a more substantial feeling of privacy. Stunningly crafted, this artistic shoji screen features a bamboo silhouette design that makes for great decoration in any setting. An additional kick plate at the bottom of the screen adds stability while protecting from scuffs. Made from Scandinavian spruce for long-lasting durability and pressed pulp rice paper to allow diffused light through, this high quality screen will create an awesome Asian decorative appearance in any room.